With such domineering personalities and captivating individual stories in single-seater racing, it could slip your mind that Formula 1 is a team sport. There’s a World Driver’s Championship, which is far and away the more closely followed, as well as a World Constructor’s Championship. Michael Schumacher had a teammate when he and Ferrari took both championships for five years running. Lewis Hamilton has a teammate of course as Mercedes hope to match the same 5-peat this year. Senna and Prost, often considered the one rivalry to rule them all, both drove a McLaren. The pervasiveness of rivalries between teammates is unique to motorsport. If you did, however, forget that it’s a team sport, you would have been reminded at the most recent race, the Australian Grand Prix which took place in Melbourne on March 25th, not only because points were awarded toward the Constructor’s Championship, but because it became painfully clear just how much each driver crucially relies on a small army of team personnel. Above, the Ferrari team prepares for a well-oiled pitstop at the 2013 Australian Grand Prix (also in Melbourne). Fernando Alonso would be stationary here for less than three seconds. There are twenty-one pit crew members in this image, and, believe it or not, there is a second rear jack man off screen to the bottom left. 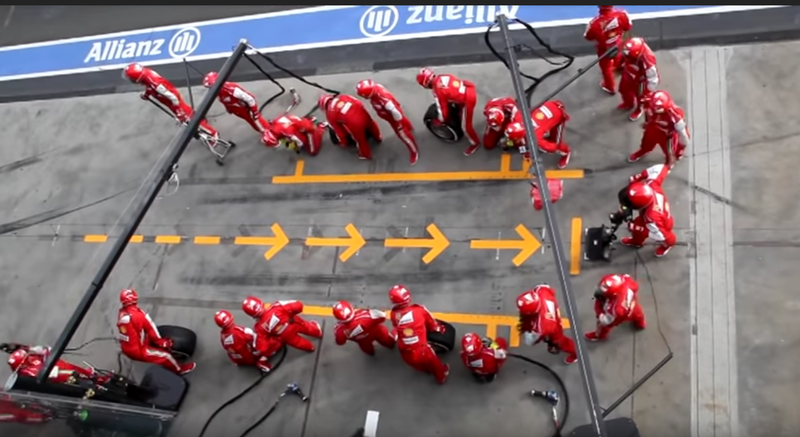 If this picture had been taken five years earlier when refueling was still allowed in the pitlane, there would have been even more mechanics waiting with a fuel hose as well. That’s not to mention all the engineers still in the garage, on the pit wall, or at the factory. While there is so much focus on one pilot, driving a single seater, competing for the driver’s championship getting more than his fair share of the glory (and blame), he cannot do any of it without each and every one of all of those people, pictured or otherwise. In this year’s race at Melbourne, the Ferrari-powered Haas F1 team had both of their drivers running in P4 and P5 when it was time for their first (and likely only) pit stop. It is worth mentioning now that the North Carolina F1 team only recently joined the sport for the 2016 season. It is not at all easy to join Formula 1 and start earning points. The competition’s youngest team’s best race finish to date is 6th, which was sensational at the time, in their debut race at, you guessed it, Melbourne. A 4th and 5th place finish would earn 22 constructor’s points. Compare that to Haas’ total haul for 2017 of 47 points (in 20 races), and you get the idea that this is a very big deal, and indeed their newfound pace was a major talking point all weekend. One of the Haas drivers, Kevin Magnusson, came in to the pits on lap 23. He would have retire the car before the end of his next lap. Two laps later, his teammate Romain Grosjean (#8) arrived for his stop. He would not finish another lap after his stop either. The best finish in team history, gone. All those points, lost. A wheel nut became cross threaded on Magnusson’s rear left tire, meaning it was not properly attached. For Grosjean, the culprit was… also a cross-threaded wheel nut, this time on the front left. It should be said that these things happen, but for it to happen twice to the same team in a span of a few minutes is bizarre. To add insult to injury, Haas were fined for unsafe release of each of their cars from the pit lane, since unattached wheels can cause drivers to lose control and/or become projectiles. In Grosjean’s case especially, it should have been clear not to release the car, as the mechanic signals appropriately. What does this mean for the team and the Constructor’s Championship? There are 21 races in 2018, so there are 20 other opportunities to earn points. But, for a team which earned 47 points last season, throwing away 22 in one go is a bitter pill to swallow. It could decide where the team finishes in the final standings. Haas finished 8th in 2017. 22 points in either direction last year could have elevated them to 6th or relegated them to 9th. Where you place in the Constructor’s Championship is revenue, both direct and indirect. The order determines revenue sharing, with winning teams earning a greater proportion, and sponsors prefer to put their name on winning cars, paying more to do so. And what happened? What really caused the freak double pit stop failure? Was there something defective with the parts? Or the wheel gun? 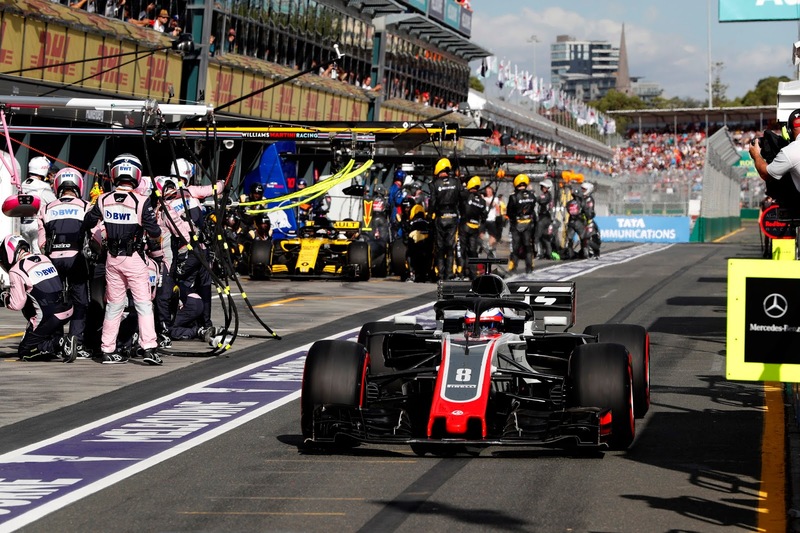 Team boss Guenther Steiner said the team lacked pitstop practice. These were two human errors. Formula 1 is a team sport. World champions depend on hundreds of people behind the scenes. The mechanic working the wheel gun matters. Any driver who doesn’t thank his team for his success should try changing his own tires, like the good old days. My personal feeling is that Haas will get through this catastrophe of a race Sunday stronger than before. They appear to be sticking together and going through this as a team. Steiner was honest and owned the mistakes for what they were. Grosjean was seen – and commended for - comforting the mechanic who made the first error on his teammate’s car. If the American team is going to move on from this, they will have to do it together.